To be a witness to history is not a claim that I can make about many moments of my life, but I am confident that being present for the return to county of 42,000-year-old Mungo Man fully qualifies. Three weeks ago I was in south-western New South Wales, walking together with my mother and accompanied by a solitary eagle flying above as sentinel. 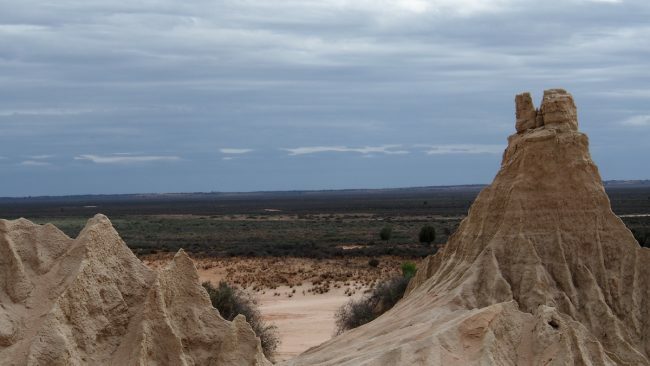 Before us lay the dry bed of ancient Lake Mungo and on its banks, clouds of ceremonial smoke cleansed a 1970’s black hearse with the bones of Mungo Man and 104 additional sets of ancestral remains. We were surrounded by several hundred people in solemn, but joyous reflection. It was clear this was to be a powerful experience. Rather than feeling like an observer to this ceremony, members of the Mutthi Mutthi, Barkandji and Ngiyampaa tribes, the three custodian groups of Lake Mungo, welcomed us as participants in the repatriation. There was no spite or bitterness about his removal 42 years ago. Only a sense of achievement, that Mungo Man had appeared to show the world how long the Aboriginal people have been on this continent now called Australia. Returned home, after being a research tool and curio in Canberra, his work was now complete. Time to rest again. There was also a broader message of inclusion that was offered by all indigenous people on that day; Mungo Man is not simply an elder for their families, rather an ancient forefather for all modern Australians. Saturday morning before the Return to Country festival celebration in Mildura, my mother and I travelled to nearby Wentworth, following the path of relatives who had been Butchers there in the 1880’s. Like many Australians, I look to my own descendants, their lives and stories, to provide a sense of heritage, connection and identity. What I realised was that Mungo Man represents a much greater anchor for my connection to this country and identity. He is our oldest known Australian and I should feel comfortable to claim a connection to him. It is perhaps a seemingly small shift, but one I am passionate about. Like all Australians, I am a part of Mungo Man’s story and he is a part of my identity. At Burninghouse we have a category of work we define as ‘passion projects’. These are worthy organisations, charities and causes that we feel strongly about and want to support through the creation of visual content. In late 2016 we partnered with social enterprises, Sacred Australia and World Weavers to promote awareness for the Return to Country of Mungo Man and to drive fundraising for the Festival celebration planned in Mildura’s Nowingi place, on the day after his return in November 2017. Our work included event capture of the initial Sacred Australia process collaborations, filming key figures in the Return to Country process, including Mutthi Mutthi spokesperson, Jason Kelly and Mungo Man discoverer and geologist, Jim Bowler. We also created the Pozible fundraising video, from supplied footage shot at Lake Mungo and studio shot interviews. All this was distributed and shared and across various owned and earned media channels to promote and celebrate this historical occasion. This passion project approach, is good for the culture of our business. It helps ensure a positive momentum internally, that not all work is done for corporate good and can lead to extremely personal outcomes, as seen with Mungo Man’s Return to Country.